The sun rises on a pagan age. Millennia ago, in a pristine, idealized Hyperborea, ancient gods commanded mighty warriors to fight in strife and battle, for honor in both this world and the next. Lord Wind escapes to a place of ancient warfare and statuesque mythological icons, which rise, towering out of the fog, moss-covered yet still glorious despite the wear of countless centuries. In this Atlantean world we encounter mysterious ruins brimming with arcane secrets and foul beasts of ancient legend, witches, chimeras, dragons, medusa, etc., all deadly perils that can only be surpassed with raw steel. Here a fantasy, that is so belittled in our time as being 'childish' or 'immature,' is embraced in way only reminiscent of ages long lost to time, where our 'ignorance' meant that these magic and barbaric worldviews that gave so much meaning and significance to our lives were not compromised by rationalism. Embrace the old gods! That is what this album seems to proclaim, in a masculine voice supremely confident and unapologetic. Very much like an Atlantean monument, this record seems to be something completely outside of our modern understanding, in that the escapist fantasy bears practically no self-consciousness. In tone, it doesn't see itself as a record of the modern age, yearning for what might've once been, or perhaps should be in our ideal biological nature, but rather it seems to be a work created by someone from such world, with absolutely no comprehension of this one we live in. And then, the fact that these are clearly synthesizers making up the entire work might seem ironic to us, but the artist is unaware or uncaring, far above such trivial things, far too noble to acknowledge the weak, insecure 'irony' that dominates our era. Synthesizers are simply the best route, in this age, to seek the lost truth through music. 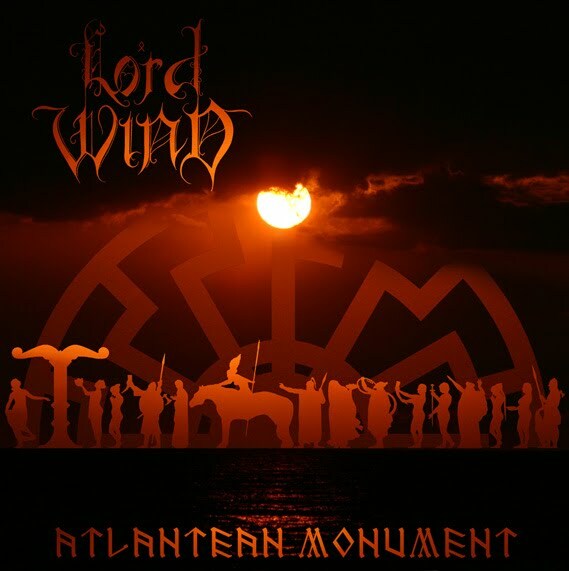 Rob Darken is well-known for his Conan-esque battle hymns, which dominate both this Lord Wind project as well as Graveland, however I'd argue that his vision appears in its most pure form in this album, the pinnacle of his efforts thus far. It's more deep and spiritual than any other Lord Wind album, which previously hardly strayed from the mood of simply fighting in some ancient pagan warfare, and it is certainly not bogged down by the angsty testosterone of black metal, such as his Graveland project. Here, Darken's most romantic vision of a pagan fantasy landscape is realized and illustrated in a way that is the most successful with the least genre obstacles; the musical form of dungeon synth, which might not have many listeners, is nevertheless far more suited to exploration of alternate realms within the imagination, which is what I think Darken most wants to do, but lingers within black metal simply due to the larger audience. Like all dungeon synth, and very much like a "monument," this album seems cold and lifeless, an ancient ruin bearing only the imagined memories of an idealized past. We are only viewing this world from a great height, where we can never get a clear sense of individual lives, and certainly not feelings. We can only imagine the people that might've built such glorious structures and try to sense the wonder and splendor one might feel in early civilization, at having waged battle with nature and begun to succeed in glory against it, and then sought out the horrific beasts that lurk from within its darkest corners, in order to combat them with a mighty blade and pure faith in heroic bravery, and likely, heroic death.